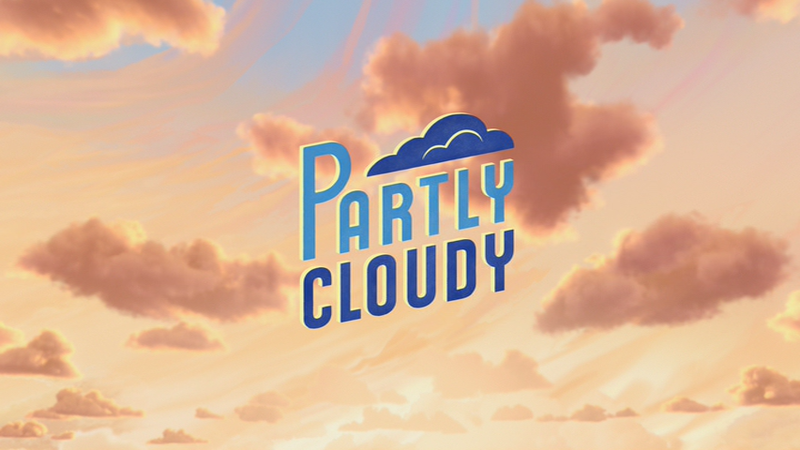 On May 29, 2009, the Pixar short film Partly Cloudy was released to theaters in front of the feature film Up. It was written and directed by Peter Sohn, with music by Michael Giacchino, and featuring the voices of Tony Fucile and Lori Richardson. The storks are flying across the sky, delivering babies to expectant mothers everywhere before returning to the clouds. It is revealed that babies are made by clouds, then are given to the storks to deliver. While all the other clouds make puppies and human babies, one little black cloud named Gus is given the task of making somewhat dangerous babies, including a baby alligator, much to the chagrin of Gus’ loyal stork, Peck. Peck puts up with the dangerous creatures, ranging from headbutting rams, to porcupines, to sharks. Gus is concerned with Peck’s appearance, as the stork keeps losing feathers from the stress of his job, and is worried that Peck will leave him for a nicer cloud. As Peck sees Gus hold out the baby shark, Peck flies away, leaving Gus alone and throwing a tantrum. Dismayed, the little black cloud begins to cry, but stops when he sees Peck arrive with a package: the cloud Peck went to provided the stork with protective gear to keep him safe during deliveries. Unfortunately, Gus’ next creation is an electric eel, but Peck keeps up a positive attitude, once again loyal to Gus. Posted in Uncategorized and tagged 2000s, Color, Pixar, Short film, Special. Bookmark the permalink.